With ample evidence and common sense, the author is able to dismantle a lot of the misconceptions and American cultural strongholds surrounding capitalism. This book is challenging in that it encourages you to see economics through a biblical lens, and in so doing think outside of the box and discard much of the faulty rhetoric designed to discredit free market systems. I highly recommend this book! This is the first chapter of Richards’ book and it’s arguably the most dynamic defense of capitalism that he cites. It speaks of the Utopian idea of adopting an economic system that resembles Heaven (a just society), which is truly an unrealistic expectation. Human choice will always come with some capacity for error, corruptness, or abuse this side of Heaven, and Richards’ point is simply that this fact is not a fault of capitalism, but rather a product of humans acting outside of their relationship with God in their business endeavors. Historically, the problem with trying to counter human error in the economic sphere, as antagonists of the free market often propose, has led to disastrous consequences. Naturally, those finding fault with the system try to impose more restraints and controls to limit human error, which unintentionally creates an environment far more corrupt than the former. Consider the documented case studies of 20th century USSR, China, Nazi Germany and Cambodia! Capitalism is not perfect, but as Richards’ inquires, what is a viable and just alternative to the free market? So what’s capitalism’s resume? The creation of wealth, shrinking poverty, high GDP, a thriving middle class, and the list goes on. Believe it or not, these are all characteristics of unobstructed markets, and you’d find that hard to refute! One of the biggest mistakes you could make in evaluating economics is understanding it as a ‘fixed pie.’ As Richards points out, wealth can and often is created and does not necessarily cause a displacing action in the global economic pie. This misinterpretation is what Richards calls the “Zero Sum Myth,” which holds that trade must result in a winner and a loser, and does not account for win-win economic scenarios. A successful tech start-up in Silicon Valley doesn’t displace the fishing business in New England for example, it simply means that the entrepreneurs in California saw a need and invented a product to address the need. This is called creating wealth, of course outside of the one-dimensional fixed pie notion which would claim the California innovators forced someone in the global scheme to lose . Understanding the global economy as a fixed pie is assuming that consumers have a fixed way of consuming, which we know not to be true, or else we’d all still be satisfied with some very obsolete products. If the entrepreneurs in California anticipated a demand, for let’s say, tax software, and the demand was met with a supply, it surely doesn’t mean that the local organic egg farmer’s third quarter sales decreased. Besides, why would we want to prohibit or even limit the God-given command to fill the earth and subdue it? Men and women were created in God’s image to create without sanctions (other than eating from the tree of the knowledge of good and evil). Is this not the heart of the entrepreneurial spirit, fostered ideally by the free market? 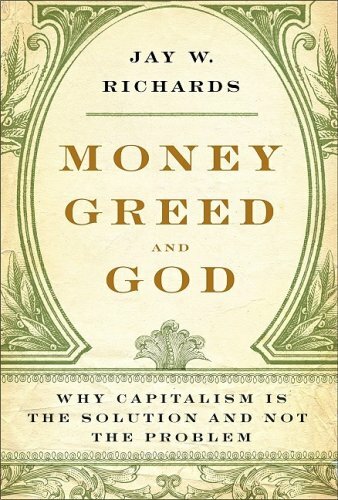 Richards works to further debunk many of the myths associated with capitalism with his profound point that, simply, capitalism and greed are not synonymous. The often misconstrued verse “The love of money is the root of all evil,” (1st Timothy 6:10) confuses the device of money with evil and clearly misses the point of Paul’s statement. Money, inherently, is not evil, but the love of it is. Using money and doing business are certainly not characteristics of an evildoer as Richards so correctly puts it, and further implies the question, ‘what principle of capitalism promotes loving money?’ Again, we’re back to the ‘humanness’ of greed being the culprit for abuse, not the system of capitalism. It would be irresponsible to compare opportunity and a free exchanging of wealth, services and goods with greed; they just aren’t congruent. So, as Richards proposes, separating capitalism with the products of greed is a good start in better understanding the global economic picture. Whether you’re a student of modern economics or not, Jay Richards presents an intelligent case from a Christian point of view in support of capitalism. Posted in Book Reviews, Spiritual Insights and tagged economics, finance, money on August 15, 2013 by joesharp.